This is terrible, terrible fabric. Seriously, it's just plain wrong. Usually I'm a connoisseur of the wrong (remind me to make my favorite bologna-and-baby-spinach on whole wheat sandwich for you sometime), but this is just a step too far. I cannot imagine a wholesome use for this fabric. (Or an evil one that would be worth the trouble.) Exclusively-branded cigarette girl outfit? Insincere "I know you can quit" quilt project? Reupholstering your donk? The only possible use I could think of for this fabric is possibly using it as a muslin for designing/altering wearable clothes.Makes you wonder if the person/team who designed this monstrosity still has a job? Sometimes, you can paper-mache stuff using a fabric base instead of a paper one. Used inside out, you could make tea bags, or bean bags, or any number of things that will get dirty. Depends on how cheap the fabric is. Or, it could make a great anti-smoking art dress. Fabric can always be useful for something. I’m a little confused. 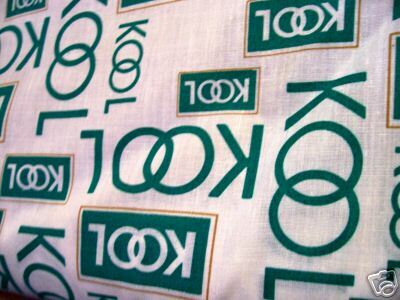 Should I infer that Kool is a brand of cigarettes? It was probably left over from the days when tobacco companies were not gettign sued and in trouble with the government. Maybe the companies used it for tents at festivals where they were one of the sponsors. Scariest part is that there is someone bidding on it. Heather’s comment prmpted me to google cigarette fabrics and found an interesting article on how cigraette textiles were used often in household textiles in the past. Here is the link if anyone is interested: http://www.fabrics.net/LauretteTobaccoQuilts.aspand xstpenquin – yes, KOOL is a particulary nasty brand of cigarettes. For over a decade, my family used a Winston branded quilted blanket at the beach. It was an excellent blanket, soft but thick and smooth so made a perfect surface for the beach (it didn’t pick up sand but wasn’t so light that it blew away). We didn’t even notice the branding, we were so immune to the stuff. No one smoked in my house but there was cigarette advertising everywhere.When my sister was about 15 she realized we’d been lying on a blanket that advertised cancer sticks. My grandfather was in the vending business, and that’s how we’d got the blanket. At that point we threw it away and got a plain one.This fabric is probably left over from the great days of cigarette vending…the 70s. Perhaps the fabric used for coffin lining for an ex-smoker who quit the hard way. This is so wrong, though, that we have to admit it’s mildly (mildly) amusing. As in, who thought this would be a big seller? And where would it sell? This is the ultimate in retro. I don’t know that it’s so “wrong” – there’s lots of things we now know aren’t as good for us as we first thought. My mother started smoking at 30 years old…at the recommendation of her doctor. She would love this fabric!!! I think I would buy a nice red fabric pen and write “un” in front of every “Kool” on the fabric should I be weird enough to purchase it. I love that the seller says there is at lease 10, possibly 30 yards. I despise Ebay sellers who don’t bother to thoroughly check out what they are selling. The winner may pay X dollars or 3X to have it delivered. It makes a big difference. Another thing…muslins can be worn if they work out. This fabric cannot be worn–IMHO. I think this was produced for the promotional merchandise cig companies used to offer as promo giftsnot for mass selling at your local Joann’s. Although amongst all the other carp they sell there these days, this would fit right in. I don’t know if I should be smiling or crying at this! I’m smiling because this fabric reminds me of my mom–who smoked a pack of KOOLs a day (even when she was pregnant with me)–and how I loved watching her light up, inhale, and exhale. I wondered how she made those smoke circles come out of her mouth! It was the 70s and I was young. Of course, I’m crying as well because she died at the ripe old age of 39, leaving me (then 11 yrs old) behind. Although I agree with everyone that smoking is disgusting, (and all the other adjectives you are well and good to use), I see this as a picture of history in the 70’s, or whatever. As a “vintage” item, it is no different than the “mammy” cookie jars that a number of people collect as pieces of “history.” My sister used to collect Kool coupons (on every pack) in the 60’s, then redeem them for Kool merchandise. (such as the beach bag/towel combo thing…)Thanks for showing this, even if it is gruesome! Has anyone looked to see that there are now 8 bids? I hope this blog entry wasn’t de-facto advertising for such an evil thing. This is advertising. They should give that fabric away for free, or rather pay you to take it! OK, as a CART racing fan, who used to love watching Paul Tracy and Team Kool Green, I think this is awesome.Not awesome enough to buy it (although my racing buddy would LOVE it), but still, kinda neat…bad, but good. So I suppose that using it for a baby quilt would be a bad idea?Seriously though – this fabric is interesting in it’s audacity, but ultimately it’s just plain wrong. Good grief. It’s a bolt of fabric. No one’s asking anyone to have their kids smoke it.